Horseback riding is not permitted along park trails; however, there are horseback riding opportunities adjacent to the park. K2 Cowichan Park Services Ltd. Camping and campfires are not allowed in the park. 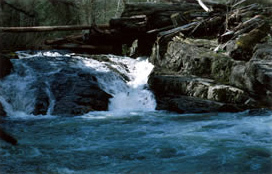 Koksilah River Provincial Park is located west of Shawnigan Lake on southern Vancouver Island. Adjacent to the Koksilah River, this undeveloped park in the Vancouver Island Forest Reserve offers good hiking, fishing and swimming opportunities. Spend an afternoon picnicking near the scenic surroundings of the Koksilah River and Canyon. This park is used mainly on weekends by residents of southern Vancouver Island, who come to the park to hike on the rustic trails and enjoy the river viewscape. Koksilah River Provincial Park is located 7 km west of Shawnigan Lake, on Southern Vancouver Island. Turn west off Hwy #1 at Shawnigan/Mill Bay Road in Mill Bay. Follow the road to Shawnigan Lake, then turn right onto Shawnigan Lake Road. Renfrew Road, a logging road, provides access to the park. Nearby communities include: Shawnigan Lake, Cowichan Bay, Mill Bay and Duncan. Approved Koksilah River Provincial Park Management Plan is available in PDF format. Because of the large size of the file, the plan is divided into four separate files for ease of access. Fishing is permitted in the Koksilah River as per provincial and federal fishing regulations. All anglers should check the current regulations issued by Fisheries and Oceans Canada prior to fishing. Anyone fishing or angling in British Columbia must have an appropriate licence. Koksilah River Park has no developed trails, however there are a number of good existing routes that lead to the river and throughout the forest and park. There is no designated swimming area at this park. There are no lifeguards on duty at provincial parks.